The purpose of this technique is to show how headings in PDF documents can be marked so that they are recognized by assistive technologies. This is typically accomplished by using a tool for authoring PDF. to mark up images (containing text) which have the appearance of headings visually. In some technologies, headings are designed to convey logical hierarchy. Skipping levels in the sequence of headings may create the impression that the structure of the document has not been properly thought through or that specific headings have been chosen for their visual rendering rather than their meaning. Authors are encouraged to nest headings hierarchically. Because headings indicate the start of important sections of content, it is possible for assistive technology users to access the list of headings and to jump directly to the appropriate heading and begin reading the content. This ability to "skim" the content through the headings and go directly to content of interest significantly speeds interaction for users who would otherwise access the content slowly. For example, in HTML documents, HTML headings are converted to correctly tagged PDF headings when the h1-h6 HTML tags are used correctly. See the general technique G141: Organizing a page using headings for information about using headings. View the tags in the Show Order panel. The following image shows a PDF document opened in Adobe Acrobat Pro. The Tags panel is open, showing heading text "Cooking techniques" tagged as H1 and "Cooking with oil" tagged as H2. The text "Cooking with butter" should be tagged as H2 but is not. Left click and drag a selection box over the content you want to tag. Select the Heading 2 tag from the TouchUp Reading Order panel. The following image shows the PDF document opened in Adobe Acrobat Pro. The TouchUp Reading Order panel is visible. A selection box appears around the text "Cooking with butter," and Heading 2 on the panel is selected. Finally, click the Show Order Panel button on the TouchUp Reading Order panel. The following image shows the PDF document opened in Adobe Acrobat Pro. The Tags panel is visible, showing that the text "Cooking with butter" is now tagged as H2. Bring up the Order panel. Access the context menu for the text to be changed or added as a heading. Select the correct heading tag for the text. The following screenshot shows Order panel and the context menu for the text "Cooking with butter." "Tag as heading 2" is selected in the context menu. You can then check that the correct heading is applied by opening the Tags panel, as shown in the following screenshot. This example is shown in operation in the working example of adding tagged headings (Word file) and working example of adding tagged headings (PDF file). Use Styles to create heading formats: Heading 1, Heading 2, Heading 3, etc. Make styles progress in a logical manner; e.g., a Heading 2 should come after a Heading 1. Select the "Format > Styles and Formatting" menu item to reveal the styles and formatting task pane. Use the Heading 1 to Heading 6 styles provided in the "Styles and Formatting" panel. Select the Home Ribbon in Word 2007/2010 and select the appropriate heading (Heading 1 to Heading 6) from the Styles group. 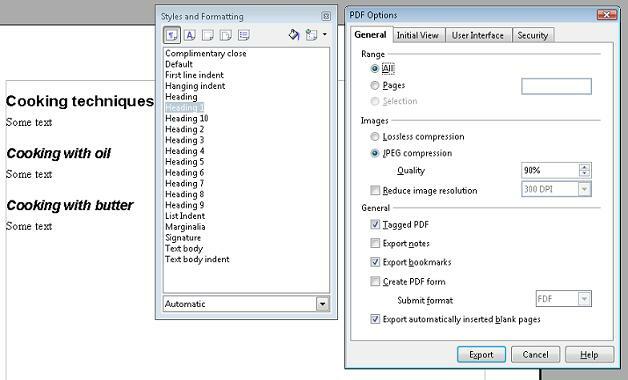 The first time you export as PDF, an Options Dialog appears. Select Tagged PDF, then select Export. Headings within PDF documents can be marked up using /Headn elements in the structure tree, where n is numeral 1 through 6 (for example /Head1, /Head2, etc.). The following code fragment illustrates code that is typical for using the /Headn elements to mark content. This is typically accomplished by an authoring tool. Read the PDF document with a screen reader, listening to hear that the list of headings is announced correctly. Using a PDF editor, make sure the headings are tagged correctly. Use a tool that is capable of showing the /Headn entries to open the PDF document and verify that headings are tagged correctly. Use a tool that exposes the document through the accessibility API and verify that the headings are tagged correctly.